Welcome to Paddle Baton Rouge! Sometime soon someone somewhere in Baton Rouge will be asking, “Where can I paddle around Baton Rouge?” The answers they get will vary. Perhaps they will find out about City Park and Greenwood Park, our two BREC parks with paddlecraft rentals. Perhaps they’ll have a friend on Bayou Manchac that would love to have them along. But what if they want something more than a relaxing trip around a small lake, and what if they don’t happen to know anyone with waterfront property? What then? We believe that any paddler should be able to Paddle Baton Rouge, and more than that, we believe they should enjoy it! In order to further those goals, we have been working on several fronts, primarily Recon, Trailblazing, and Cleanup. Recon: What you don’t know can’t help you. Scouting recons, both in the water and on public areas, provide the information we need to know where help is most needed or most useful. 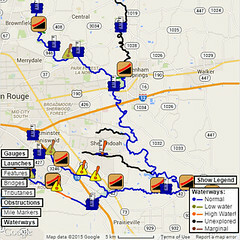 Recon runs have been done down Ward Creek, Bayou Fountain, the Comite River, and other local waterways. Trailblazing: When you can’t get there from here… yet. Some of our best potential paddling waterways are also our most impaired. Out of sight and out of mind, they end up blockaded by deadfall or completely dammed by flotsam collecting at bridges (active or derelict). We head out and open canoe lanes through the blockages, preserving the natural look while making paddling possible. Cleanup: Because nobody wants to paddle by *that*. In our recons and trailblazing expeditions, we’ve discovered just how significant a problem litter is. Nobody wants to paddle through a sea of bottles, cans, and containers. On the other hand, if there weren’t so much litter, some of our paddle-accessible waterways would be delightful things of beauty. We are that other hand, and we mean to make a difference. One final goal, but one *we* are not currently working on, is paddler access. Our recon runs have found numerous places where we can put in and take out as necessary, but the more we improve paddling conditions around Baton Rouge, the more paddlers we hope to see out on the water. There are several BREC parks that front our waterways, and access of some sort is already possible from them, but as we improve the quality of our paddling areas, we will certainly be looking into having better access in the future. For now, however, there is plenty of work to be done.